Electronic Geometry Textbook is a knowledge management system that manages geometric textbook knowledge to enable users to construct and share dynamic geometry textbooks interactively and efficiently. Based on a knowledge base organizing and storing the knowledge represented in specific languages, the system implements interfaces for maintaining the data representing that knowledge as well as relations among those data, for automatically generating readable documents for viewing or printing, and for automatically discovering the relations among knowledge data. 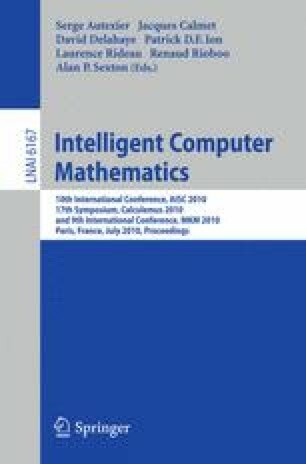 An interface has been developed for users to create geometry textbooks with automatic checking, in real time, of the consistency of the structure of each resulting textbook. By integrating an external geometric theorem prover and an external dynamic geometry software package, the system offers the facilities for automatically proving theorems and generating dynamic figures in the created textbooks. This paper provides a comprehensive account of the current version of Electronic Geometry Textbook.